Don Ed Hardy is an American tattoo artist raised in Southern California. He was a pupil of Sailor Jerry Collins. Through his association with Sailor Jerry, Hardy was invited to study tattooing in Japan in 1973 with the Japanese classical tattoo master, Horihide. He became recognized for incorporating Japanese tattoo aesthetic and technique into his American style work. Today, Hardy is retired from doing actual tattoos, but oversees and mentors the artists at his San Francisco studio, Tattoo City. Since the 1960s, he has concentrated heavily on non-tattoo based art forms, especially printmaking, drawing, and painting. He has also started his own clothing label which is becoming popular to a cult market, especially amongst the cast of Jersey Shore. 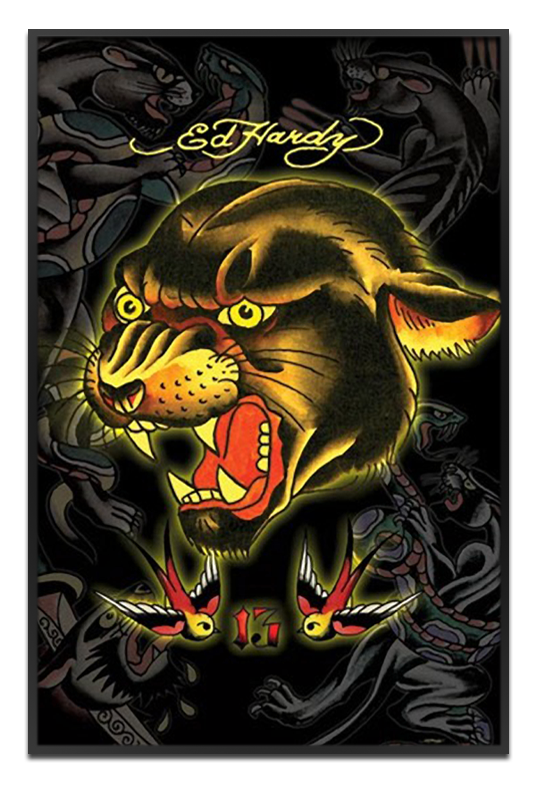 We have a selection of Ed Hardy's posters for sale at $10. each.